One of our clients drew up a score sheet for focus groups, and insisted the winning concept would have to score above 7 to proceed. Same client them tested the finished shoot and couldn't understand why the scores were lower by a 1-point-something. As if there was a winning formula for concepts! Yeesh--if there was we'd all be rich. Or unemployed. 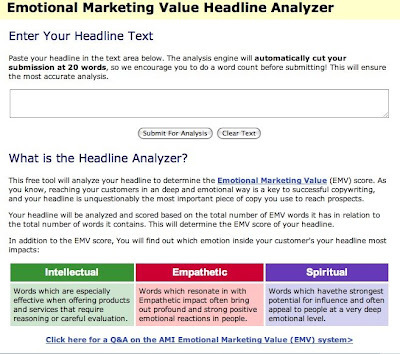 I just scored 100% EMV on the headline analyzer... I put in. "Beautiful beautiful beautiful in every respect"
Something tells me the thing needs fine tuning. "Fart like you mean it" scored a solid 40% with an emotional classification split between intellectual/spiritual. "We bring good things to life" scored 33%. I don't know what you're all talking about - this magi-o-matic headline analyzator is unadulterated genius. @Teenie Advertising by CYA metrics. Bah! @Susan Ellis Thanks for tuning me in. I work with websites/databases, and let me just say I love developing metrics tools. It's art to me. I've also come to realize most of the marketing reports are not very realistic indicators of trends. For example, for certain products we get random spikes in traffic for a month, but those do not translate to sales or even inquiries for them. The "Headline Analyzer" is far better satire than tool, like something you'd see on Conan. Of course I'm going to have to try this thing for kicks. Not that I'm a great headline writer but, after 30 years of radio copywriting and now I'm blogging, it's certainly a practiced art. We're all going to be replaced by machines one day anyway, right? @Makolyte Yes, my point exactly. Metrics can be fun...but at the end of the day, not sure how much influence data actually wields. @Steffan Postaer When headline analyzer was first sent to me, I assumed it *was* satire, couldn't believe it earnestly existed. Ad: No, I hadn't seen the article so thank you. Scary stuff. I referenced machines because I've been haunted by Stephen Vincent Benet's "Nightmare Number Three" ever since college. Nightmare Number Three envisioned a bloody, black humor revolt by all of mankind’s machinery, with the nameless narrator huddled in mad fear, speculating on how things could have gone so wrong (”letting six million people live in a town./ I guess it was that. I guess they got tired of us./ And the whole smell of human hands.”). Haha! Let's just hope the machine overlords are Robin Williams 'Robots'-ish and not Terminator-ish!